The Dwarven Armored Mudcrab is a pet that can be purchased from Calcelmo in Understone Keep. He originally found it while excavating the ruins of Nchuand-Zel. Its initial location is Calcelmo's laboratory in Understone Keep. The crab is essential, and will not engage in combat. Its main function is to carry items, and it has a carry weight of 20 and it will follow you even if you already have another pet following you. You can instruct it to wait at a city, wait at its current location, wait at your house, or to carry items. It can also be summoned using a teleportation spell. The mudcrab cannot be detected by Detect Dead or Detect Life. If following you, it will occasionally give you leveled clutter, which could be an ore, a Dwarven clutter item, a gem, a soul gem, or gold. My Pet Mudcrab: Buy a Dwarven Mudcrab. The mudcrab will only ever speak in ellipses. The mudcrab can be told to wait at any of your houses, including Hearthfire homes. While idle, the mudcrab will regularly burrow into the ground, even when indoors. 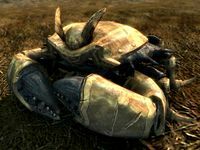 The Dwarven Armored Mudcrab model is based on a satirical "Crab Armor DLC" advertisement from PC Gamer in 2011, poking fun at the Horse Armor Pack for Oblivion. Do not bring the Dwarven Armored Mudcrab to Druadach Redoubt after siding with Madanach during the quest No One Escapes Cidhna Mine, as it will be hostile towards the friendly Forsworn there. Adding the mudcrab to the DruadachRedoubtFaction faction (RefID E3609) will fix this problem. This page was last modified on 27 March 2019, at 09:24.